There is something to be said about a state that has more than 50 million people yet still has wilderness. The coastal urban zones of San Diego and Orange counties, Los Angeles and the Bay Area dominate the landscape with skyscrapers, industry and production. But there are the places in between. The Sierra Nevada, a white granitic snow-clad vein blocks outward expansion, to a certain degree. The importance of preserving this powerful natural fence was recognized at the turn of the 20th century by the legendary environmental activist, John Muir. He would be the first of his kind and began fighting the fight to preserve California’s natural beauty. Natural beauty. It seems almost silly to talk about the value of non-monetary resources in the 21st century. But these places are precious. One only needs to wander in California’s high country, breathing in clean, pure air with the rich smells of vanilla and pine from Ponderosa or to see the energetic power of the ocean’s peeling waves breaking upon a desolate chaparral shore somewhere on somewhere on the Central Coast. 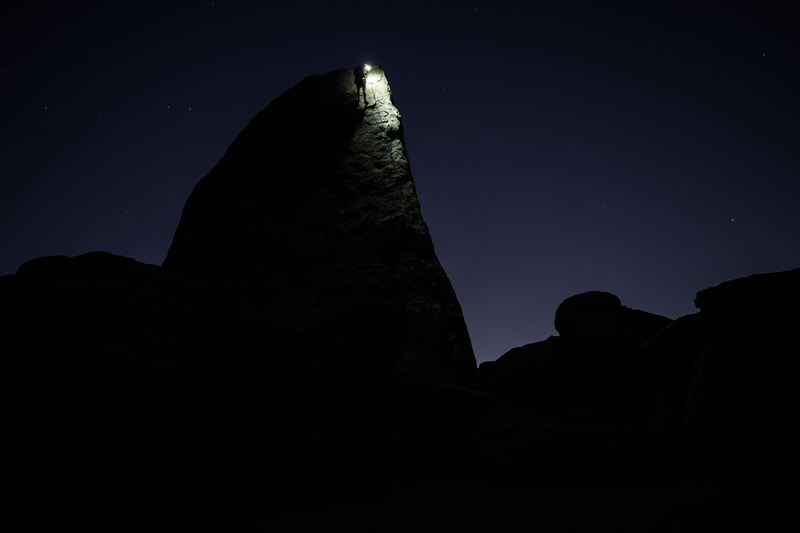 Climbing in the Alabama Hills below the Sierra Nevada at night. Emerson’s rubric for a healthy, fulfilling life cannot be forgotten as we strive ever forwards, organizing and devoting ourselves towards goals surrounding market optimization, material accumulation and sound asset management. After all, there is something to be said about the value of the places in which we live. But it’s hard to have a strong sense of place without wonderment and a feeling of obligation to nurture these areas. So here is to the power of the pines, the allure of the sea. The taste of cool mountain air or a salty gulp of a warm sea breeze. They might not be worth a million dollars to all but they sure are to me.